For many reasons (unimportant for this current discussion), the medical/nutrition/diet/food industry has continued to give us information on food, nutrition and health that is outdated and, in some cases, just wrong. They refuse to see the big picture of our life-history as a species, and this leads them in wrong directions. Their continued and unrelenting recommendation for high carbohydrates in our diet is the most obvious example of this wrong-headedness; the demonization of fat is the other side to this coin. 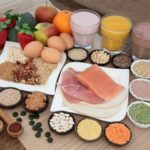 Our initial weight-loss strategy and maintenance approach involves changing the way one looks at the macronutrients that we eat, that is, the protein, fat and carbohydrates that make up the bulk of our food—and then making appropriate adjustments and choices. Although the macronutrients apply more to weight than do the micronutrients (the vitamins and minerals), the perspective of paleo-nutrition (or the caveman diet), can help us to make better food choices in the vitamin and mineral area as well. I have spent time in the office with my patients going over the approximate macro-nutrient proportions that our cave-person (paleo) ancestors ate and compared those numbers with our modern menu. It is, however, important to understand that this is an inexact science and various hunter-gatherers—whether present day or our ancient ancestors—exploited the food sources that were available to them in their particular environment (econiche). For example, the Inuit of the Arctic region are hunter-gatherers, but their diets differ greatly from the hunter-gatherer Kung-san of South Africa. And please remember that just as there are geographical differences among modern hunter-gatherers, there are also differences between ancient hunter-gatherers—depending on where they lived. Further, the differences between the food choices of selected, contemporary hunter-gatherers and the differences between these people and our remote ancestors would be even greater. This is because modern hunter-gatherers are the rare and unusual human remnants that have been pushed into environments by us—the civilized agriculturalists. This is illustrated in today’s headlines of Brazilian loggers clearing forest and putting the existence of the Awa tribe in peril. So, at best, in order to come up with reasonable approximations of our prehistoric diets, we must be aware that ‘approximation’ is the operative term. However, we can certainly say this: no group of past or present hunter-gatherers ate anywhere near the percentages of carbohydrates that those of us in the industrialized countries now consume. We can quibble about how much meat vs. seeds and nuts, but it is inarguable that these people ate a relatively low-carb diet. Further, even when they did eat carbohydrates, the supply was inconstant and depended on the season and the weather; they were certainly not able to get fruits and vegetables trucked in all year long from California, Florida or South America! And, they never ate grains (wheat, rice, corn, etc.). Yes…corn is a grain and not a vegetable. Are Trace Element Supplements the Answer to a Healthier Diet? After a hunting party would bring the prey animal back to the home camp, the group would not only eat the muscle meat, but would feast on everything that was edible, including the organs (kidneys, liver, brains, bone marrow, etc.). They would likely have been pickier if they could count on a steady supply of prey animals, but that was not the way it was: they lived in a feast or famine environment where they could waste nothing. And this would be the same for fish and birds. In our present environment of constant and abundant supply, we usually eat only the muscle meat, but all we have to do is look back three or four generations when meat was less available (and more expensive) and see our grandparents and great-grandparents of just a hundred or so years back eat significantly more of the livers, hearts, tongues, kidneys, etc. of butchered animals. We are very picky eaters these days! It turns out that the organ meats are relatively high in trace elements and vitamins, so this source that was eaten more often by the ancients is, essentially, gone from today’s menu. For example, liver is a great source of selenium, chromium, iron, zinc and copper as well as folic acid, B12 and the rest of the B vitamins as well. Calves liver would be a terrific choice for today’s menu since these animals are milk fed (with some grass feeding), but rarely thrown into the feed lot; therefore, they are a more ‘natural’ source of meat/organs based on what they are fed. Short of eating calves liver twice/month, in order to make sure you are eating a good source of trace elements, shellfish should be included in your diets (fossil remains of shellfish meals are commonly found among paleo-people who lived near the shore). These include lobster, crabs, shrimp, oysters, clams and mussels among others; and while some of these can be expensive, an economical choice here would be mussels. Just be sure to get fresh ones at your market of choice, and steaming them is fast and easy. One additional benefit: kids often love them. Rounding out your diet for trace elements should be nuts, seeds and kelp (seaweed). Pick up the seaweed in an Asian market, or if you do not live near one of those, Amazon is the place to go. Just add the seaweed to your salads. “Well,” you might say, “what about the supplements that I take containing trace elements?” Trace elements are much better absorbed from animal sources than from grains or supplements. A good example of this is zinc. This element is present in good amounts in wheat, yet we cannot absorb it! The reason for this are the compounds present in wheat called phytates which block its absorption; further, when eaten from animal sources, they are complexed with natural proteins and much better absorbed. So, as long as you eat a well-balanced paleo/Atkins style diet and are not a vegetarian or a junkfood eater, no need to take trace elements by supplement. But, there is no one-size-fits-all—it depends on your diet and individual needs determined by genes and other aspects of your environment aside from diet.